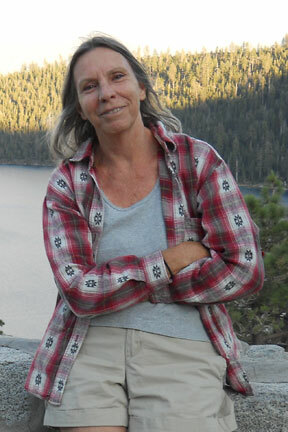 Gail King, a Bay Area native, has lived in the Northern California town of Monte Rio for over 40 years. She has written poetry all her adult life and was the publisher of Doris Green Editions, a small literary press active in the ‘70’s and ‘80’s. Boxes & Chairs, her third selection of poems, was published by What Leaf Press in 2006. Pat Nolan, born in Montreal, Quebec, Canada in 1943, has lived most of his adult life along the Russian River in Northern California. He is a poet, translator, editor, and publisher. His poetry and prose have been published in numerous magazines, among them Rolling Stone, The Paris Review, Big Bridge, New Magazine, The American Book Review, Otolith, Poetry Flash, and Exquisite Corpse as well as in literary magazines in Europe and Asia. His work has also appeared in various anthologies including UP LATE, Thus Spake The Corpse, Out Of This World, More Poetry Comics, and Saints of Hysteria. The Random House Book of Twentieth Century French Poetry and Poems for The Millennium, Vol. I,include his translations from the French of Surrealist poet Philippe Soupault. Pygmy Forest Press published a selection of his translations of Soupault’s early work entitled Where The Four Winds Blow in 1993. Nolan was the editor and publisher of The End, a 70’s literary mimeo magazine, founder of The Black Bart Poetry Society, and co-editor and publisher of its newsletter, Life Of Crime in the 80’s. He has always played an active role in publishing his own work. In the 70’s, 80’s, and 90’s, as the publisher of Doris Green Editions, and since the turn of the century, he has published numerous limited edition chapbooks under various and whimsical imprints. Nolan started Nualláin House, Publishers in 2011 to serve as an umbrella under which he can continue to publish and make his work available to a wider audience. Pat Nolan is the author of over a dozen books of poetry. Tangram Press of Berkeley published a limited, letterpress edition of a selection of his tanka entitled Cloud Scatter in 1993. Tangram Press has also published 4 Poems from Exile In Paradise, and a handful poem cards in limited, letterpress edition since then. Fell Swoop Press of New Orleans issued Volume II of The Nolan Anthology of Poetry: The Modern Era in the spring of 2003. More recently, his works have been published as private or limited editions. All are hand sewn in the style of the Japanese side stitch book. His tanka selections, Thin Wings (2003) and Untouched By Rain (2005), were published by Empty Head Press. In 2005, Re:issue Press reprinted Fly By Night (Doris Green Editions, 1992). Later (On The Fly Press) and Carbon Data (Last Cookie Press) were published in 2007 and 2008 respectively. A selection of prose poems, entitled Intellectual Pretentions was published by Editions de Jacob in 2009. Ah, Bolinas! A Travel Journal was also published in 2009 by Not My Hat Press in a limited edition with original block prints. A selection of Chinese derived poems, Exile In Paradise, was published in limited edition in 2010 by Bamboo Studio Press. Poltroon Press published the collected newsletters of The Black Bart Poetry Society, Life Of Crime, Documents In The Guerilla War Against Language Poetry, in 2010. Also in 2011, Egret Moon published Jacks Or Better, A Travel Journal. Along with Keith Abbott, Maureen Owen, and Michael Sowl, Pat Nolan is a founder member of The Miner School of Haikai Poets. Their haikai no renga “All Ears”, “Random Rocks” and “Poetry For Sale” were issued as limited edition chapbooks. Nolan’s first published novel, On The Road To Las Cruces, was issued under the Nualláin House imprint in 2011. The Last Resort, A Lee Malone Adventure, also from Nualláin House, was published in August, 2012. Your Name Here, New Poems appeared in 2014 from Nualláin House. Poetry For Sale, a selection of Haikai no Renga (linked poetry), for which he wrote the introduction and participated, was published in the Fall of 2016 and is also available from Nualláin House, Publishers. Exile In Paradise, a selection of poems derived from a lifelong appreciation of Chinese poetry, was published by Nualláin House in the Fall of 2017. The Spring of 2018 saw the publication of So Much, Handwritten-Typewriter, Selected Poems Volume One, 1969-1989, and the thousand marvels of every moment, a tanka collection, was published in the Fall, both from Nualláin House, Publishers. His online serial fiction, Ode To Sunset, A Year in the Life of American Genius is currently posted in installments at odetosunset.com.